So, I've shared with you about our road trip to Club Med Cherating Beach, its kampong-style setup, welcoming accommodation, multifarious food and a host of family-friendly activities that await you when you go on an all-inclusive holiday at this 5-star resort. If you have not, you can read the first post here. In this second post, I will tell you more about the pristine beaches, an enchanting firefly tour and the fun-filled night activities Club Med Cherating has to offer. I also have an exclusive giveaway coming up at the end but do read through the post to get there! Staying in a beach resort means there was no way we could miss out on a trip to the beach, especially when the kids were looking very much forward to it. We decided to make our way to Pantai Beach on a late afternoon followed by dinner at The Rembulan. Even though there was brilliant sunshine and a cooling sea breeze, we were surprised to see that there were not many people and we practically had the whole beach to ourselves! Woohoo! For me, I was just contented to sit on the sand, feel my round tummy, breathe in the fresh air and appreciate the tranquility. It was a moment of peace, of joy and of family bliss. Awww, that is how a good holiday should feel like, right? Since the girls had more energy to spare, the hubby also took them for a jog. Yes, he's one real sporty dad! To many, it might just be an empty beach. But to the kids, this was paradise. At the discovery centre which is located right at the resort lobby, the hubby and I saw a list of tours available and we were wondering if we could, and should, fork out one evening to go for a tour. It seemed like time was scarce and precious, yet we thought we should do something more special on this holiday which would hopefully leave behind lasting memories. 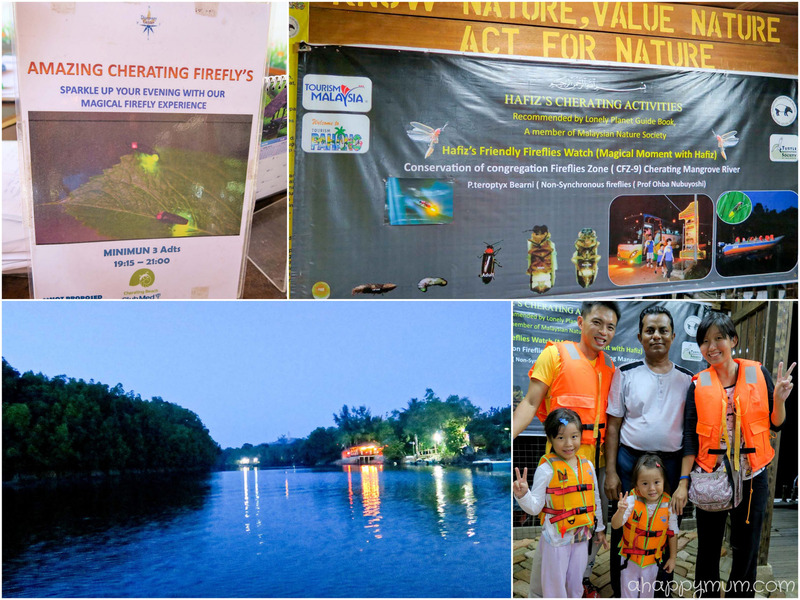 So, after some consideration and a talk with the GOs, we decided to go on a FIREFLY tour which sounded like the most child-friendly yet unique one of the lot, something which I knew would most likely thrill my two animal-and-bug lovers. On the evening of the tour, we were told to have an early dinner and gather at the lobby at 6:45pm. There were only two families who signed up and I was secretly glad that it was going to be an intimate, cosy group session. It took only less than ten minutes for the shuttle bus to reach the village and to a little hut where we were going to embark on our cruise. Yes, we were not going to look for fireflies by marching through a jungle, instead, we were going onto the boat and cruise along the river! Now, that does sound much more inviting and comfortable, right? We were told that we should not apply any kind of mosquito repellent as this would deter the fireflies and possibly kill them. So, as a precaution, I dressed the kids in long-sleeved shirts and pants though eventually, we were surprised to realise that there were no mozzies along the journey after all. Our guide for the tour was Mr Hafiz, who has a passion in fireflies and has done much research on them in the past few years. He gave us a brief introduction, some safety guidelines, led us to put on our life jackets and soon we were on our way!! At the start, I didn't really know what to expect or what to hope for, although I did wish that we could see as many fireflies as we could. As the night slowly dimmed, Hafiz took us on a slow voyage along the mangrove river and began to explain to us about the different types of fireflies, their lifespans, characteristics, mating cycles and so on. Then he kindly informed us that once we crossed a bridge, we would have to switch off our mobile phones, cameras and made sure there was no light of any sort. Yes, which essentially means I was unable to capture any video or picture to show you. Then again, Clayton, the excursion manager who was with us, took some videos with his GoPro4 but alas, the surroundings were so pitch-black that it did not manage to capture the fireflies too. So, unless you are a professional photographer with a superb DSLR camera and lens, if not, it would be virtually impossible to get even one nice shot. On the other hand, isn't it great to put down our electronic devices once in a while, sit back, relax and purely immerse in the beauty of the night and admire the wonders of nature with our loved ones beside us? As we passed the mangrove trees, we could see dozens, maybe even hundreds, of fireflies resting amongst the leaves. If I have to describe them, they were like tiny green speckles that don't seem that significant when they appear as a few, but try to imagine a swarm and hopefully you can visualise that sparkling beauty. Now, the best part of the tour was when Hafiz used his torch and hand signals to motion to the fireflies, magic happened when they actually responded. What did they do? Well, they all flew towards our boat, towards us. Some rested on our shirts, some landed on our heads, some laid on our palms and some just crawled around our fingers. They were so tiny that you practically don't feel anything and all you see are those beautiful, green flickers of light. The kids were absolutely fascinated, delighted and awestruck. And so were we. Now we can tell people that we have not just seen, but even touched and held real fireflies in our lives! We went to tree after tree and did the same thing for at least an hour, yet every time it happened, it still felt so extraordinary and breathtaking. You know how lucky were we? We were the only boat out that night and had the whole river and all the beautiful fireflies to ourselves. Yippee. Words won't do this spectacular tour enough justice and the only way you can feel what I mean is to experience it when you get a chance to. I sure hope you do. As many of you know, we are a family of night owls and somehow, my kids are always bursting with energy after dinner. Remember how they made an impression and became the talk of many GOs (why, even the Chef Du Village knew their names and invited them up the stage) when they boogied every night in Club Med Bintan? So, we were definitely thrilled to know that in Club Med Cherating, the fun doesn't stop at night too! Live theatre shows, games, dancing, all-you-can-drink bars and even circus performances - these were what made us happy to be awake even when the clock struck midnight. At the main bar, which was beside where most of the dancing took place, the kids were delighted to find a kids' drink list and they could even place orders themselves for any drink they liked. Angel was particularly tickled by the Frozen Coke drink which had a cheeky name called "Don't Tell Mama". I have to say these two were simply in love with the Crazy Signs Dance, which is a Club Med signature, and they would do their best to keep up with the moves and danced alongside the GOs. 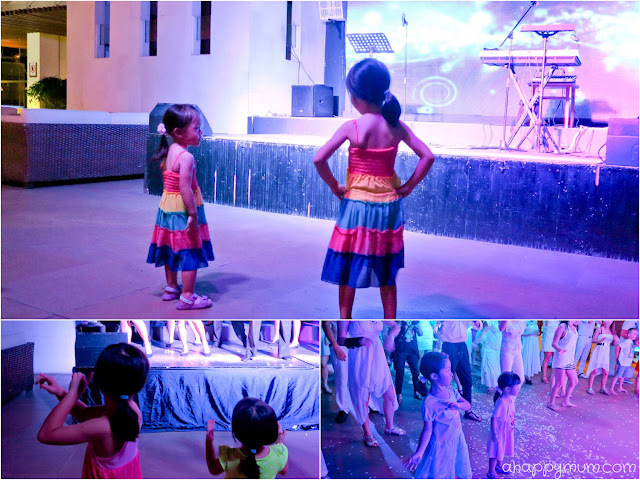 Even when the party has ended and there was only a live singing performance, these two just couldn't stop dancing too. Sometimes they would just shake their bodies, sometimes we would throw them up into the air, sometimes we would hold hands and spin around in circle. Whatever the case, all we wanted to do was to immerse in the fun of the night, enjoy the music and cherish that feeling of being one happy family. For us, one of the biggest highlights of a Club Med stay are the live performances put up by the GOs. On this trip, we watched all the shows on our three nights, which included a lip-sync singing contest, a Halloween dance show and a circus performance. 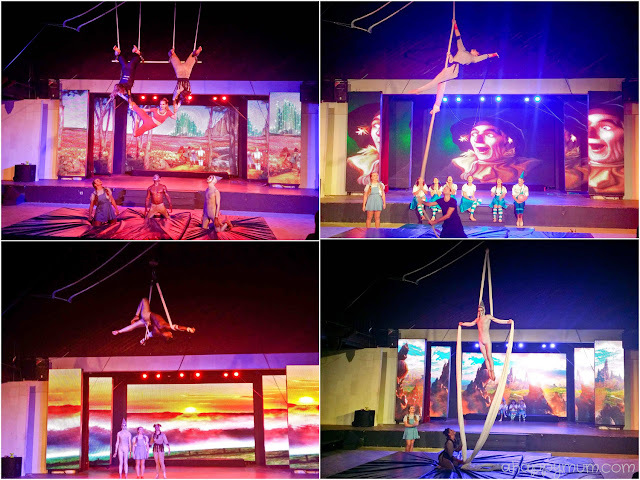 The one that earned the loudest applause and made the deepest impression in us was the wonderful performance put up by the circus team, which involved many dangerous stunts, including a rope stunt and three-person trapeze, and we were blown away by every segment of the show. What was more unique was that there was even a plot adapted to the story of Wizard of Oz to accompany the stunts, and the GOs were dressed up as memorable characters like Dorothy, the Witch, Tin Man and the Tiger. On our last night, there was also a cocktail party by the pool and while there were alcoholic drinks for adult enjoyment, there were also mocktails dedicated for kids (and pregnant women like me), much to our delight! After which, there was the Club Med highlight party - White Sensation, which saw fanciful costumes, singer impersonations, fireworks, dry ice effects and all night long dancing! That was definitely a great way to end off our finale night in Club Med Cherating. Now, rather than just telling you about our experience using words and photos, let me show you all the fun we had in this video montage. Push Push by Kat Deluna was one of the Crazy Signs songs and the girls just couldn't stop singing it even after the trip! There, are you craving to go for a family holiday too right now? Hereby, we wish to extend our heartfelt thanks to some of the Club Med Cherating staff - Barbara, Clayton, Yee, Elizabeth - who went the extra mile to make our vacation such an awesome one. Holidays may end but memories last forever! One thing I am sure of, Club Med is definitely a family-friendly holiday destination which promises lots of fun and joy for everyone! We definitely hope to visit even more Club Meds in future! 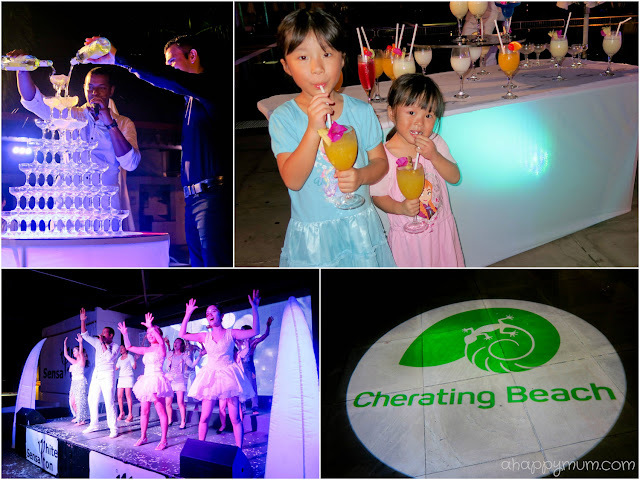 To find out more about Club Med Cherating Beach, visit their website or Facebook page. Now, is this the moment you have been waiting for? 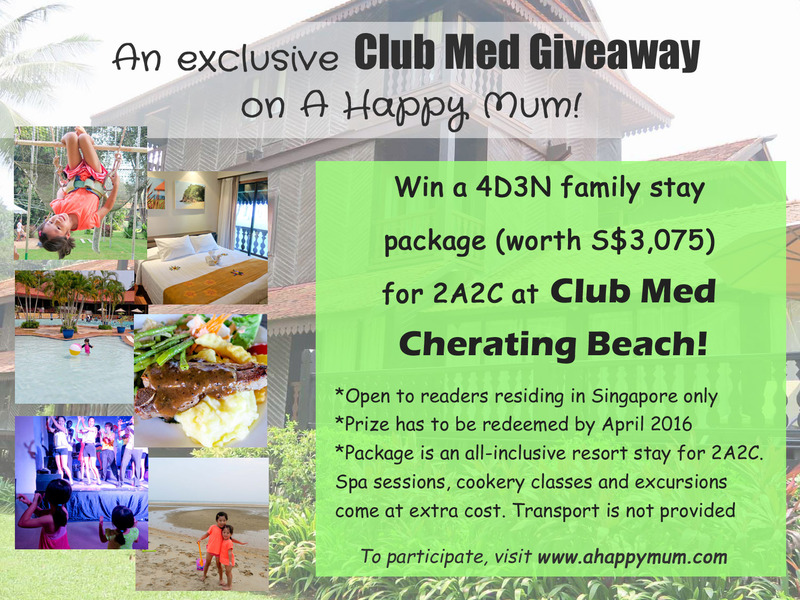 For those who desire to go for a family vacation, A Happy Mum is now giving away a 4D3N all-inclusive resort stay for 2A2C in Club Med Cherating! Yes, it can't get more awesome than this, can it? To join in the giveaway, leave a comment in this post with your name, email address and state what you love most about Club Med Cherating Beach. Indicate in the Rafflecopter widget that you have done so and to increase your chances of winning, you can choose to carry out the rest of the options. Note that to be fair to sponsors and other participants, all fake Facebook entries will be disqualified. This giveaway will end on 22 Oct 2359hrs. Disclosure: This is Part II of a two-part series of conversations between Club Med and A Happy Mum. We were sponsored a 4D3N resort stay in Club Med Cherating Beach in writing this review. All opinions are our own. Love your experiences in Club Med and since I've only been to the one in Bintan, would love to bring the family for a Club Med experience too! I love the night performances! To my 3 sons, I guess my boys will love club Med as it's a heaven to the boys! My hubby and I can also rest. Have never been to any Club Meds, and have always wanted to experience it with the children. So I suppose what I like about Club Med Cherating would be simply because it is Club Med! What I love most about Club Med Cherating Beach is that it is stretches over four kilometres of fine sandy coastline and has 3 different beaches and most importantly my little ones love playing at sandy beaches building sandcastles. i like the idea that they are out exploring and experience nature fun and not coop at home. Personally, I have never been to any Club Med but I heard great reviews about all! Love to have my first maidan experience soon! Love your posts! Wish I can go there for a break too! I have never gone for any beach resort in Malaysia, i think a road trip to a beach getaway sounds so fantastic! I love to go jungle walk with my kid. It is definitely something that you can't get in town. I hope i can bring my family there and enjoy the facilities of Clubmed Cherating! Have been a sahm for 3yrs to 2kids with no help, i really hope can use this chance to rest, let the kids enjoy and most importantly a chance for me to date my husband again. What I love about Club Med Cherating Beach is the beach, the wide variety of food, the friendly GO and the fun-filled activities for the whole family. We have never been to any Club Med resort before and my girls will definitely fall in love with it. Thanks for the chance. What I love most is the live performance by the GOs. I am sure my kids will love these performance. We love Club Med and the all-inclusive holiday without any worries and fuss! Have booked 4D3N Club Med Phuket in Nov and hope to win another one for the March Holidays 2016. Will be bringing and paying for the parents and probably even extend our stay if we win this trip! Thank you A Happy Mum for hosting and having such a wonderful giveaway! I like that its laid back and idyllic while Club Med still has activities for us to enjoy though! We love the all inclusive concept and endless fun throughout the day! It will be a best 10th anniversary for our family if we win it! I have never been to Bintan and like Club Med coz its kids friendly and tons of activities to join while staying there. Thanks for sharing your interesting trip. It really gets me very excited. You really make the place sounds like a Holiday Paradise and I'm really tempted to bring my girls there. We have never been to any Club Med Resort but Club Med Cherating Beach seems like an ideal place. My kids will love the clean beaches, the firefly tour and "partying" at night. Hope they will get a chance to experience it soon. Love the sun, the sand and the sea! the wonderful GOS! The Club Med experience is simply amazing. Cool kids friendly menu & activities and great nightly performances! an ultimate fuss free destination. Love the beautiful beach. Thank you. Have yet to bring the whole family to any beach resort for a holiday. Club Med looks great with its facilities and activities especially the live performances by GOs. Hope to win this for the family! I like the fun filled night activities after enjoying at the beautiful beach for the day. So relaxing yet so happening! Club med is one of my must go holiday destination! Hope to win this to bring my gals there for holiday! What attracts me will be just how Family Friendly and Kids Friendly is Club Med Cherating, it will be simply lovely to bring my family there to experience the nature and all. The fact that they have great staff, and my kids will be in good hands! has to be the beach and buffet! How fun for the kids and us to bask in the sun and be fed throughout the day! The luxurious beach and family friendly facilities! My family has never been to any Club Meds, and have always wanted to experience it with the children. What I like about Club Med Cherating would be the fun-filled activities that the whole family can engage together to build greater family bond. Club Med is a beautiful and wonderful place for family. Hope to win this for my family. So we can have a wonderful holiday at the club med. I like Club Med as it has something for everyone (young and old), and there are loads of activities throughout the day till the wee hours at night.. Have never been to Club Med with the kiddos before so hoping to win so they can have their first experience @ Club Med! I love Club Med for it is a place for the ultimate relaxation and fun with my family and friends, especially the one at Club Med Cherating. It has miles of fine, sandy beach, numerous water activities and events in the resort, and its friendly service as reviewed by many guests. Hope I can bring my family to this fantastic place for a vacation to enjoy! Thanks! I have never been to any Club med places and would love to go with my family for the first time. The activities will be interesting to our child too. wI'll want my child to explore the activities from club med. We went to Club Med Phuket and Bintan with our girl before and absolutely love it. We have yet to be back when number 2 came along. Will love to have the Club Med experience with our family of 4! Thanks for the giveaway! I love the kids' club, with children's trapeze thrown in! Havent been to club med before but would love to experience the fun you had! Thanks for the giveaway! We super lurved cherating. It's the most laid back and beautiful club med, imho. But it's also has a private for adults only pool near the beach. We wanna go again!! Think my city kids need more of such outdoor activities and club med sounds fantastic for family fun and bonding. Our family have never been to Cherating and the young ones plus myself have never seen fireflies! Everything sounds wonderful and exciting!!! I've never been to Club Med but I would love to try out all the activities while my kids have fun at the kids club! This is the best place to relax! We would love to live the jungle paradise experience of Cherating Beach. I've never been there but I read that it was described as a tropical Garden of Eden with lush forest all around, with the sound of the macaques and gibbons lulling you to sleep, a quiet and peacefull beach and a pool with an amazing view, and of course with the facilities to cater to every member of the family! Perfect family holiday spot even just for a few days! I like the part where we get to enjoy as a family for most of the activities yet able to alone some alone time with my other half. I have never leave the side of my kids from their birth and would like to.take this chance to let my other half know that he is not forgotten! Water activitis are of cause my kids favourite and anything that make them happy would make me happier. Firefly got to be my favourite activity because it seems "magical"
My husband, me and my kids haven never been to any Club Med. 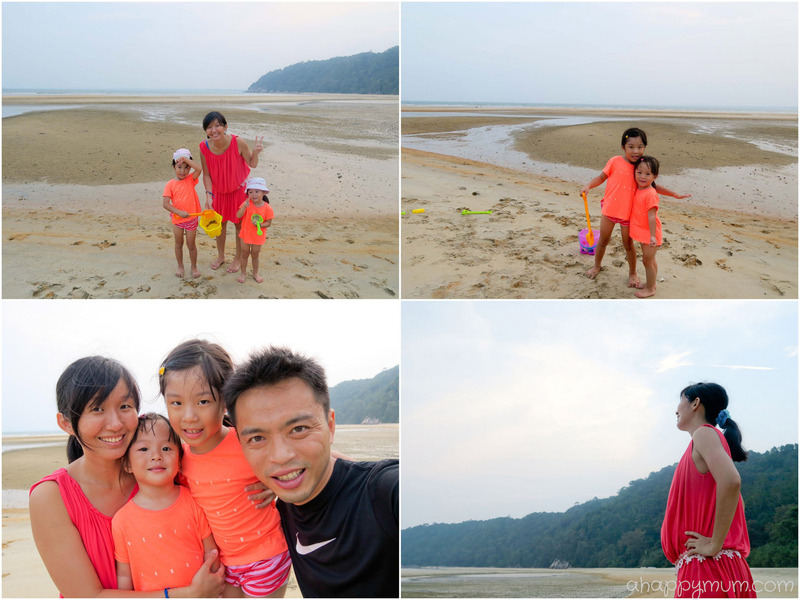 After reading your experience at Club Med Cherating, I hope to bring my kids there for all the fun activities! It will be a good place for my son to de - stress after his PSLE exams. You had me at the pristine beach. The endless beautiful beach for the kids to have a wild time picking up the shells! Wow! Lovely place! Would love to win this giveaway! Thank you for hosting this! I love Club Med as a kid, looking at the beautiful pictures of the beach, the resort and all the fun activities in a brochure. I never had a chance to go as a kid and I'm sure my kids will love to go to Club Med to enjoy all the fun. Especially the beach. And the pool. And the dancing. And all the fun activities! Of course my hubby and I will be getting our well-deserved rest knowing the kids are in good hands. I heard Club Med Cherating Beach has turtles sanctuary too! My sea animals-loving hubby will love to see some hatch! I have never been there before, wishing to win to have the first experience with my hubby and our 3 kids, i bet they will love the sand and wind. Thank you for giving everyone a chance to win this awesome staycation with our family. I've heard so much about Club Med and the kind of services they have there, but never had a chance to experience it before. Hoping to win this and bring our kids along on our wedding anniversary! I'm sure they will be thrilled to be there and have lots of fun with the sun, sea and sand! I love about Club Med Cherating Beach because there are full of night activities such as circus performances, live theater shows, games & etc .It's looks the night still young & more exciting. The most I looking forward are the enchanting firefly tour. It'd be great experience and opportunities to be close to nature. You can't enjoy that kind of experience in Singapore. Follow all steps to be done! I love that thw activitiea there are suitable for kids and adults! Hope to win this. I absolutely love the idea of having a family trip with my 2 toddler tgt wit my parents. The great family bonding activities allow us to spend as much time together. Also, there are so many activities suitable for my 2 young toddler, Club Med is definitely the perfect destination ! Love the sun love the beach.. long time nv go nice beach resort ..hope tis time there is a chance..
Would love to hit the beach with ma boys! Love the beach at club med cherating. I would like to bring my toddler son to the firefly tour bcos he didnt been to one before. Next is to the beach as he loves to play with the sand and water. An all-inclusive beach holiday with a wonderful kids activity club seems just SO easy - just book, go and enjoy. The firefly tour sounds particularly amazing too! Absolutely love Club Med especially the GOs whom made the whole experience so remarkable, memorable and enjoyable! Hoping to visit all the Club Meds around the world ! Thanks for this beautiful descriptive post! Well written! Nice work! Good luck to everybody! Hope someone wins the prize! Tks for the giveaway! Love the firefly tour & kids activity club. Looking back, it has been 5 years that we have not travelled. Hope to bring my kiddos to club meds! Good luck everyone! Thanks for hosting this giveaway for ClubMed Cherating! Chanced upon this post and it would be a great family bonding experience for my family of 4. I had brought Jiaying and Jiaen to Sentosa Beach, with the sun, sand and sea! It would be an AWESOME experience to be able to bring them to Cherating and play under the sun, building sandcastles with the sand and swimming in the sea. This gift of love will not be for us, the adults, but more for the children, the joys of our lives. Simply love the tranquility, lovely beaches and waters. My family would love to enjoy the nature and forget the hustle of busy Singapore. Club med cherating beach is defintely a wonderful place for a holiday destination because its a family orientated place for great bonding sessions, away from the buzzling busy city of spore. And yes parents and children themselves do need to be rewarded for a good relax holiday after working so hard for the family ! hope to win this family trip because i believe it will bring grins on my family's face ! Firefly tour seemed fun & exciting for the whole family! Love the Kids Club and Baby Club Med where we can deposit the kid and the baby twins. Longing for a resort holiday after having 3 kids (which can be so difficult), and only Club Med comes to mind! I like the idea of the night performances and kids club/baby room where the kids can also have their fair share of fun!!! I love the series of family friendly activities available at Club Med Cherating Beach where we can have fun and bond together. I love club med cherating for it is a all-inclusive resort with beautiful beach. I have never been to Club Med. But by reading your blog, I love the services and activities provided by Club Med. Personally we have never been to Club Med or Cherating beach. After reading I simply love & excited about the Beach fun & Live performances come as a bonus & definitely my family going to cherish it .. I have been to Club Med Cherating 20 years ago and was totally in love with it. I love the comfortable Resort and the beautiful beach. The international style buffet was really good to eat, I love the fun activities and the dance nightly after dinner. Their service was good, food was good, can get to know many friendly tourists and have lots of fun playing the games together. Would be awesome if I can go there again on my coming birthday. I love that the resort stretches over 4 km of find sandy coastline which allows my hubby who is a lover of the sea to relax, the endless entertainment, performance put up by the staff to keep the children entertained and most importantly for me to enjoy a date with hubby without having to worry about the kids! Love most about Club Med Cherating Beach is that the resort is surrounded by beaches. 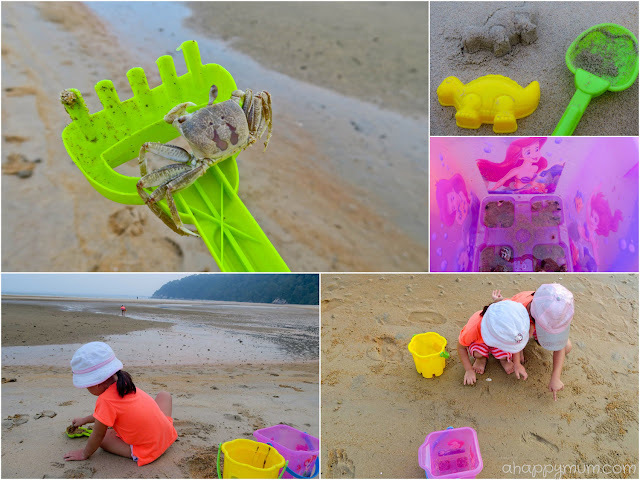 My kids love beaches and its definitely their paradise that can keep them entertained all day! Looking forward for such a relaxing, rejuvenating getaway ! Leave a blog comment with your name, email address and state what you love most about Club Med Cherating Beach. We have yet to go to any Club Med resort. Hope to win, go experience and enjoy it with my family. Taking this chance to reward my hardworking hubby, an advance encouraging treat for my prince first who will be having his PSLE next year and my little cute princess. Good Luck! Never been to any Club Med Resort. Hope to win as an anniversary gift in this coming Nov so we can have a relaxing memorable experience with my love hubby and son. Thanks for this giftaway. I have always wanted to go Club Med, especially the one at Cherating Beach. Club Med always provides the best and it would definitely be the most exciting and fun holiday for my family and myself. We will surely enjoy ourselves in the resort with the food, activities, beach, taking photos and everything. I like Club Med as it has great activities for family and kids. Hope to win this to bring my elder son for this getaway as we have spent less time with him since his younger brother was born. I have never been to Club Med. I like the beach and their activities for kids and adults. We will definitely enjoy the getaway because we have not been to anywhere for holiday this year due to my eldest boy's PSLE. My fingers are clicking here again! Hey pals, have U done so? sharing is so fun.. <> All easy steps.. Do it! Do it! Hope to win this giveaway for a retreat for our whole family consist of hubby and 2kids. The Club Med is really a family friendly place to stay. With the activities to keep them busy we as patents will always be so happy to see their lovely happy smile. And moreover they have a Live performances which my kids loves it. Just by reading your blog I am already getting excited to go for this holiday. Hope to win this as my own birthday gift. Thanks for organising this giveaway. Totally love Club Med as its a resort with something for everyone to do!!! Plus the kiddies haven't been there before (me the oldie included) and it should be a great trip for the whole family!!! It is already so interesting to read about what you have done in Club Med Cherating, I am sure it will be even more awesome to be experiencing it in person! My family and I have long wish to visit a Club Med resort but have yet to do so. Would love to bring my family to create lasting memories! Club Med Cherating looks nice & clean, definitely a fun place for the whole family. 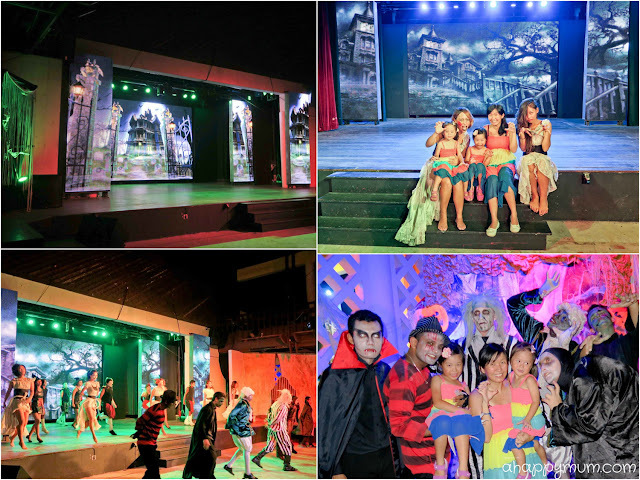 I like the performances put up by the GOs, the Halloween dance show and circus performance looks very entertaining for the whole family!! I love Club Med Cherating Beach for its many activities including the amazing performances and the Pantai Beach, kayaking would be awesome indulgence for me! I love Club Med Cherating Beach for it many programs and activities,a great family holiday ,hope to win to have a family holiday with hubby and kids. 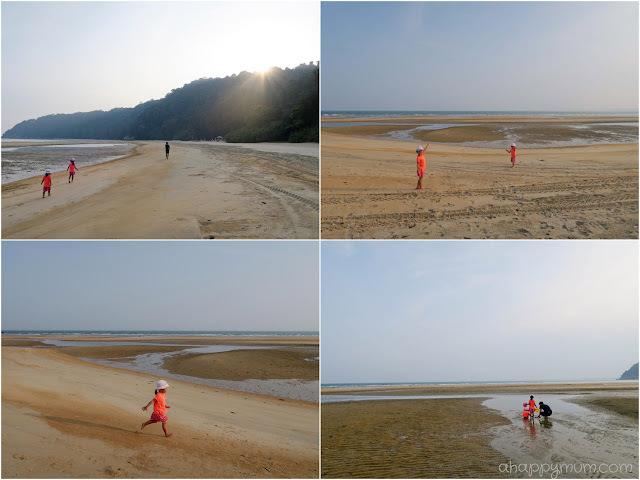 I love Club Med Cherating Beach as it stretches over four kilometres of fine sandy coastline and has 3 different beaches and most importantly my little ones love playing at the beach and building sandcastles. Thank you for this great awesome giveaway!!! I love all the fun activities and exciting performances and the miles of sandy beach! I love Club Med for it is a place to chill and relax and fun with my family and friends. With its miles of fine, sandy beach, numerous water activities and events in the resort, there is something for everyone! The live performance of Club Med are definitely things to look forward to. My kids will love the Halloween dance show and the firefly tour! I like the beautiful beach and the activities and programmes conducted by Club Med. Hope to bring my 3 young children there for a short vacation! My family are all beach lovers! Will be great experience for kids to join the fun and activities of Club Med and good break for us parents. Been such a long long year with overwhelmed responsibilities and work for us. Look forward to winning this and have a good break as a family. Thanks! I love the live performance of Club Med. Hope to be the lucky one as never have a chance for short vacation. Thanks for the lovely giveaway. I love most about the beach with the fine sand and u might see those sea creature for suprise, not only kids can have fun even patents can relax and playing with kids very great bonding away from gadgets.